You might not be walking the red carpet or prepping an acceptance speech, but that doesn't mean you can't sip like a star on Golden Globes Sunday. Moet & Chandon, the official champagne of the ceremony enlisted model, culinary expert and founder of the Impatient Foodie blog, Elettra Wiedemann, to concoct the official cocktail. I got my hands (eyes) on the recipe for the Moet Bijou Rouge so that you can toast your favorite actors and actresses as they accept awards for jobs well-done. Combine Gin, Curacao, Sweet Vermouth and orange bitters in a cocktail shaker. Stir very well with ice, and strain into a coupe glass. 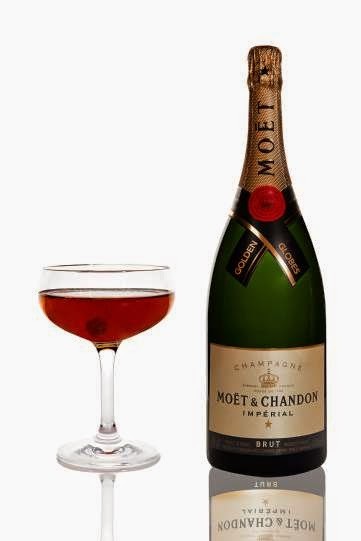 Top with Moët & Chandon Brut Impérial and garnish with brandied cherry.